Have you ever wanted to make your own metal jewellery but were not sure how to start? Following on from the launch of our bronze metal clay, we now have a bronze metal clay starter kit available. This is ideal for beginners to jewellery making, or beginners in working with bronze metal clay. 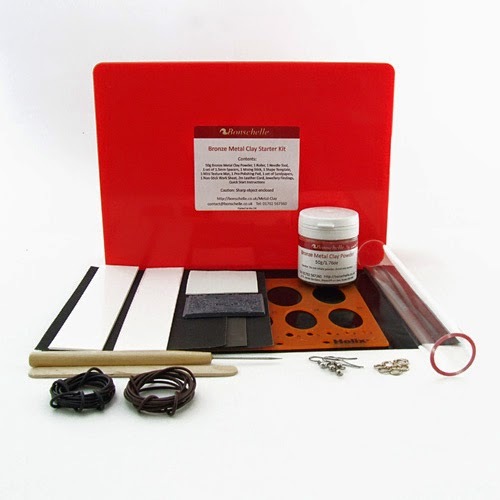 The kit contains a 50g jar of Bonschelle Bronze Metal Clay Powder and all the basic tools you need to get you started. It even includes some jewellery findings, so if you make jewellery items you have what you need to be able to wear it straight away. 50g of clay is enough to make a few small pendants or earrings. A quick start guide is included, but you also get access to a full colour downloadable PDF guide, which includes more detailed steps and a project to make a pendant and matching earrings. If you have never made jewellery before this may be just what you need. Metal clay is very easy to shape and texture, ideal for expressing your creativity, without needing any metalsmithing experience. Bronze is also relatively inexpensive compared to silver, so it's great for experimenting with. It's also suited to making mixed media jewellery as you can add elements to your finished metal design just as you would with sheet metal e.g. adding enamelling, or resin. Kiln fireable stones can be added to the clay and fired too, if you like to have a bit of bling in your jewellery. Bonschelle Bronze Metal Clay does need to be kiln fired, but we offer a kiln firing service if you don't have access to one. 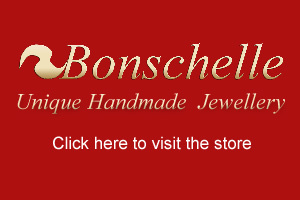 To find out more about the kit and our firing service visit Bonschelle Metal Clay.